I've watched that race nearly ten time and i can assure you that he only grip racing two or three corner , and he drifted the entire race, which is again completely different from the manga. 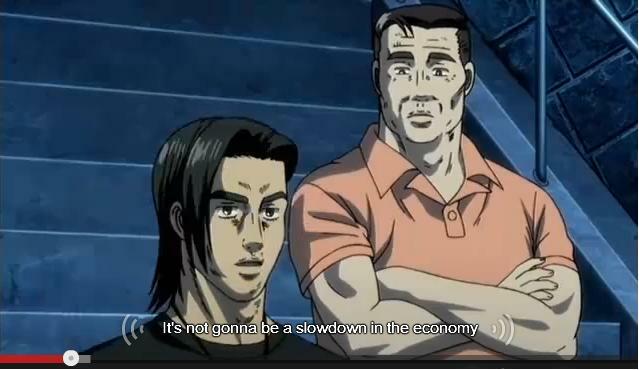 Pffff even Takumi admitted it in Fourth Stage. He thinks Keisuke would beat him in a race if they faced off again. That's not the line I read/heard. While watching Keisuke train, Takumi mentioned: "If we were to race right now, I think he would probably be better than me." No stipulation of downhill/uphill. Episode 3 translated to English. The youtube link http://www.youtube.com/watch?v=TryrxA4YhNI will now have the English CC subtitle. I didn't do a good job on this one. It only took me two hours so the translation is very rough. I didn't have time to check for accuracy either. If someone wants to step up and convert it to .srt and refine it, please feel free to do so! Thanks Perry, its better than nothing! I Can't Stop Loving You started playing. Too bad the race only lasted one episode, though. Thank you for the subs Perry. Even if they aren't perfect they get the job done. Converted to SRT for the raw file, starting to proofread/clean now. Just curious if we don't have a 720p because the lower res files were easier to upload or because no one has ripped it yet? Either way, thank you! Thank you very much for the subtitles on the 3rd episode. Awesome job! 1) I hate they omitted the highway scene as well. Looks like they changed some things for Episode 4 as well. I'm liking 5th Stage so far.. But at the same time I'm disappointed by how much they've been cutting out. They must be on a low budget.